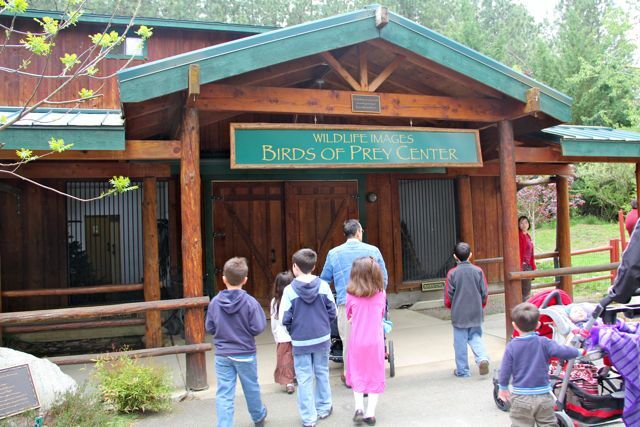 Our family recently attended a field trip to an Animal Rehabilitation & Information Center which cares for over 1,000 wild animals every year at no charge to individuals or organizations. When we arrived they asked everyone to break up into 4 groups of 15-20. Since Amy and her family were there as well, we joined up with them and immediately had a group of 19, with just our two families! This is Beauty. 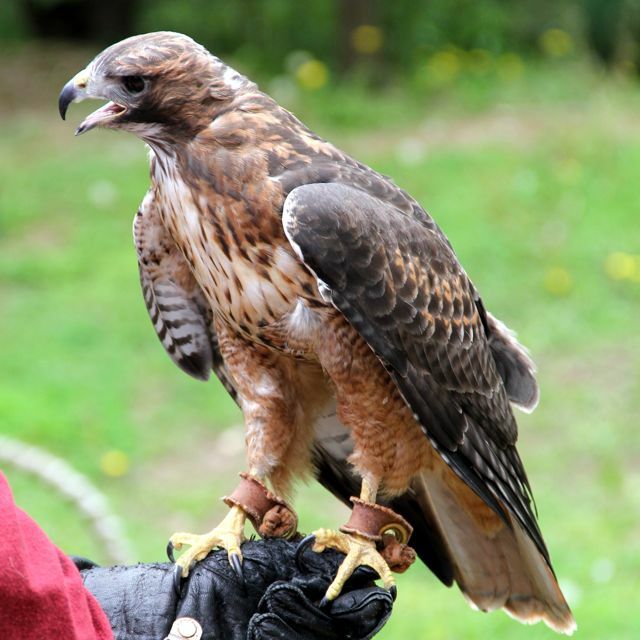 She is a Harlan Hawk, a sub-species of Red Tailed Hawks, and is considered one in a million because of her unusual color phase! This crazy bird arrived after she hurt herself flying into a building. After she was rehabilitated and released, she flew into the very same building again! I guess they later found out that she was blind in one eye and has limited vision in the other, making her unable to survive in the wild. This cute little Barn Owl got her name from the "Petri" brand cigar box that her egg (and 3 others) arrived in, after her nest traveled in a haystack by truck to our area. She was the only one that hatched. Fascinating Facts: The Barn Owl has acute hearing, with ears placed asymmetrically for improved detection of sound position and distance, and it does not require sight to hunt. 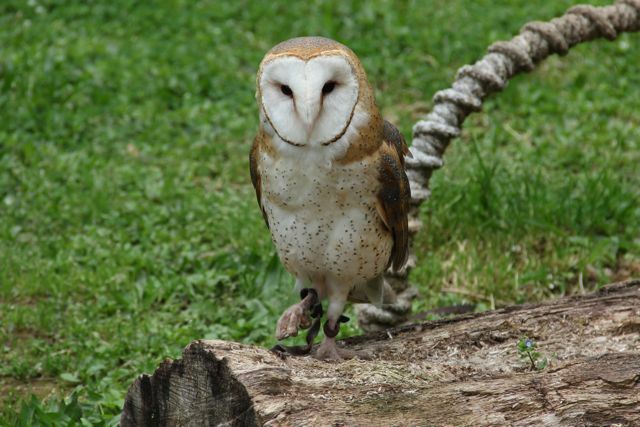 Barn Owls are referred to as Nature's Mousetrap because of their efficiency at catching mice and rats. They weigh less than 1 pound, but will eat up to their own body weight in mice each night! Despite her damaged wing, which prevents her from being released, I thought Chase was gorgeous! And we learned so much about Peregrine Falcons... What an amazing bird! 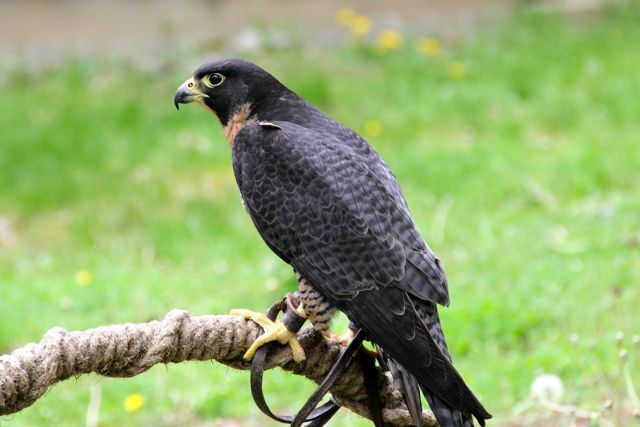 Fascinating Facts: Peregrine Falcons have been called nature's finest flying machine. They are nature's fastest fliers. Peregrines have been clocked diving at speeds up to or a little over 220 miles per hour! The peregrine falcon is probably best known for its spectacular method of capturing prey in mid-air. It flies faster than other birds and, when hunting, it increases its speed by making aerial dives with the wings partially or fully pulled in, to attack its prey, which is killed instantly. 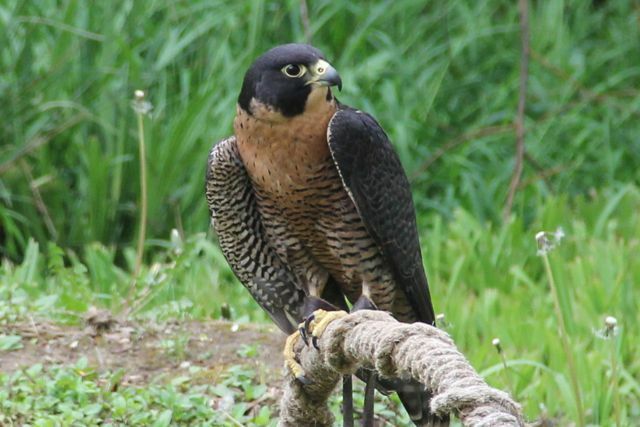 Peregrine falcons have adapted to living in cities. Cities offer tall buildings with ledges for nesting, water sources, large populations of pigeons and starlings for food, and have few natural predators. In some places, where pigeons are especially a problem, Peregrine falcons have been introduced. 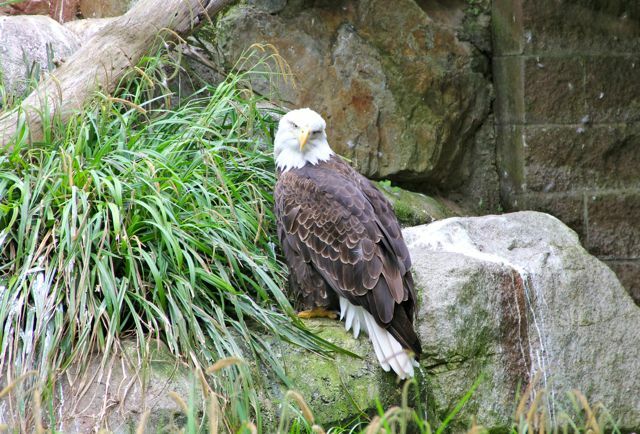 Cazadero has a permanent eye injury, and since hawks depend on both eyes for hunting, he isn't able to be released. Fascintating Facts: Red-tailed hawks, like all raptors, (usually) have excellent vision. They can see colors, like most humans can, as well as the ultraviolet range. 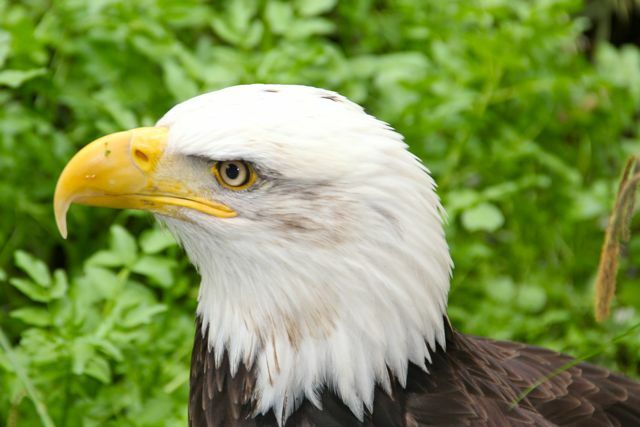 This means that the hawks can perceive colors that humans cannot see. 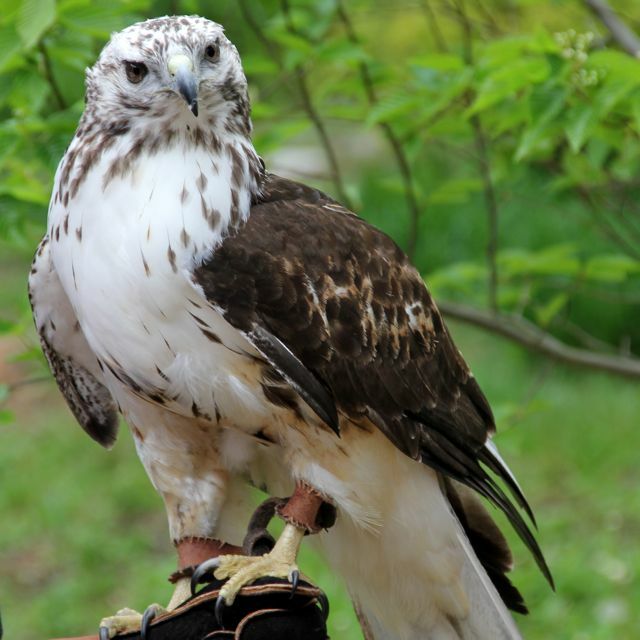 Red-tailed hawks are diurnal hunters but see black and white well enough to also hunt at dusk, the time when nocturnal animals, especially rodents, begin to awaken and move around. 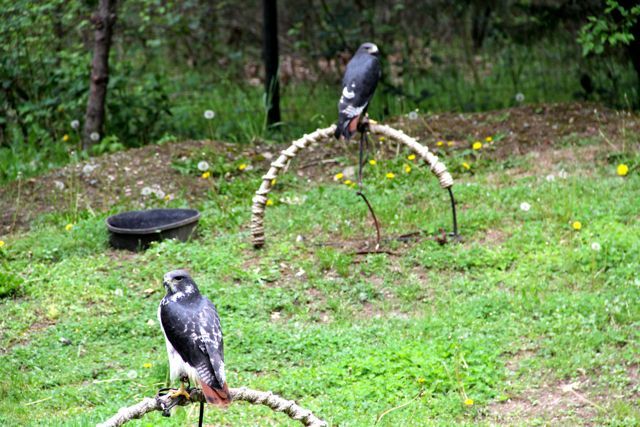 Fascinating Facts: Augur buzzards are one of the most numerous types of hawks in Africa. In the Americas, the term “buzzard” generally refers to vultures, but in the Old World, the word’s original meaning was “hawk”. Some of the other birds we were able to see inside their cages included: Golden Eagles, Great Horned Owl, Turkey Vultures, an Western Screech Owl, American Kestrels, a Ferruginous Hawk, and more! 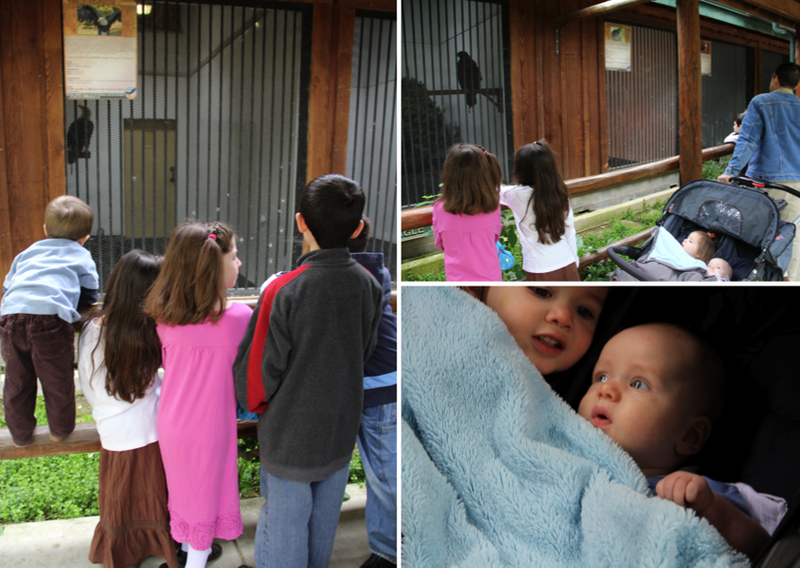 We saw four Bald Eagles - two in the first cages and these two in a bigger cage with an open window. I wish I could remember their names... I'm pretty sure one of these two is "Miss Jefferson" but I could be wrong. 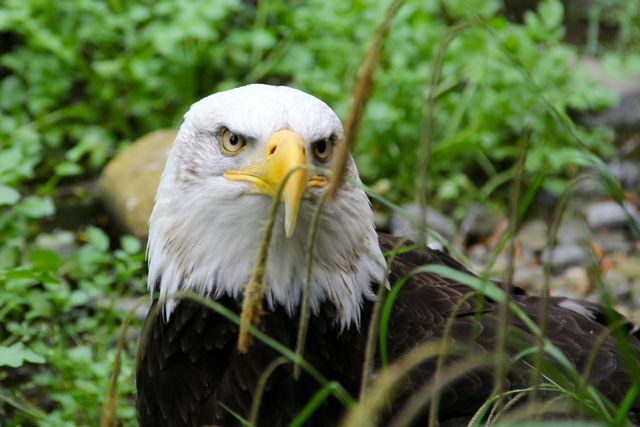 Fascinating Facts: Bald Eagles don't actually acquire their white feathers and yellow beaks until they are 3-5 years old. They are usually around 7 years old before their heads are completely white. 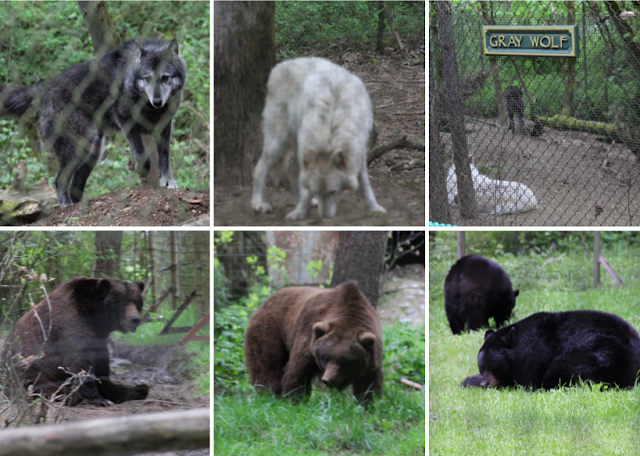 In addition to all of the birds, we also saw Wolves, Grizzly Bears, Black Bears, a Cougar, Badger, Bobcats, Coatis, a Gray Fox, and more! Oh, this cute little River Otter, Nestle, is a retired movie star! Her last movie was Evan Almighty. We all had fun watching her play in "Critter Creek." 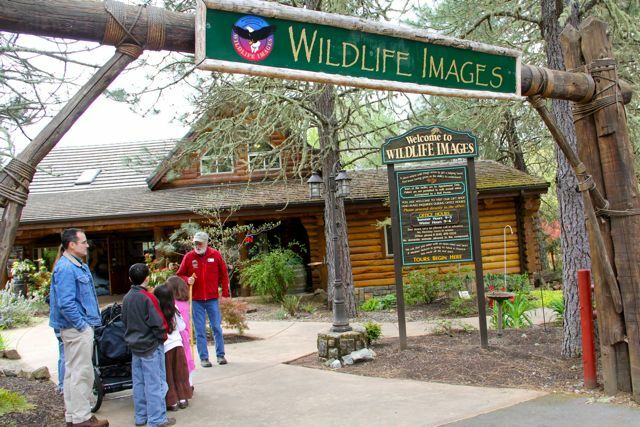 Overall it was an excellent field trip and we learned all sorts of interesting things about wildlife. What a wonderful way to view Gods creation! I love studying Zoology. The pictures of the bears and wolfs are my favorite. After watching that movie "We bought a Zoo", I really appreciate them more. I loved the owls. 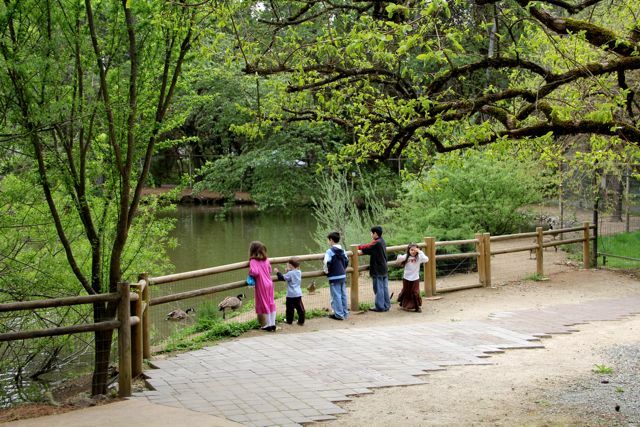 Looks like a good time by mama and kiddos. A most interesting post; great photos; thankyou! I am so behind posting and reading posts. I was going through some of your old posts and of course I enjoy them all....but my Nature Boy is going to go "ga-ga" ove the falcon pictures. Thanks for posting them....your pictures are wonderful!! !